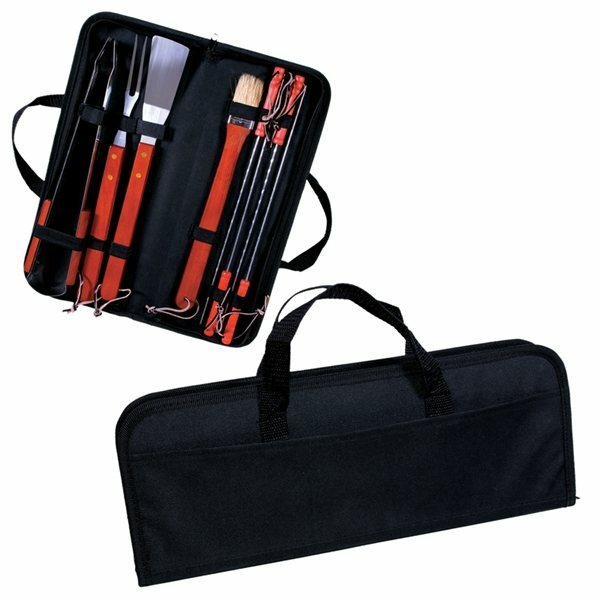 Portable BBQ set includes the essentials for a day at the grill! Durable 600D Polyester carry case with zipper closer, exterior storage pocket, and 12" webbing handles. Set components made of stainless steel with wooden handles and feature includes- spatula, fork, tongs, basting brush, and four skewers. A great BBQ set, it's good quality and portable as well. I would buy these again. And the imprint turned out great. Great quality product + nicely done embroidery. I'm hooked! An excellent cost with this product. Nice obvious print. Popular.